Jamie and Claire have set sail to Jamaica (aka the West Indies) in search of Young Ian, and this week’s episode focuses on life at sea. The myths, superstitions, seasickness and drama that engulfs the simplistic lifestyle of seafarers dependent on the wind, the ship’s supply of clean water and food rations, and general good luck. Fergus has also joined Jamie and Claire aboard this adventure, and he’s brought along a wife. Not wed by the church, but Fergus explains that Marsali (Laoghaire’s daughter) and him are handfast. Jamie does not approve. Mr Willoughby is also aboard. After a few weeks at sea, a British Navy ship signals the Artemis for help. Captain Thomas Leonard (played by Charlie Hiett) climbs on board to inform the Artemis of their ailed troubles. Claire believes it to be Typhoid Fever and convinces Jamie to let her keep her oath as a doctor to help the sick. 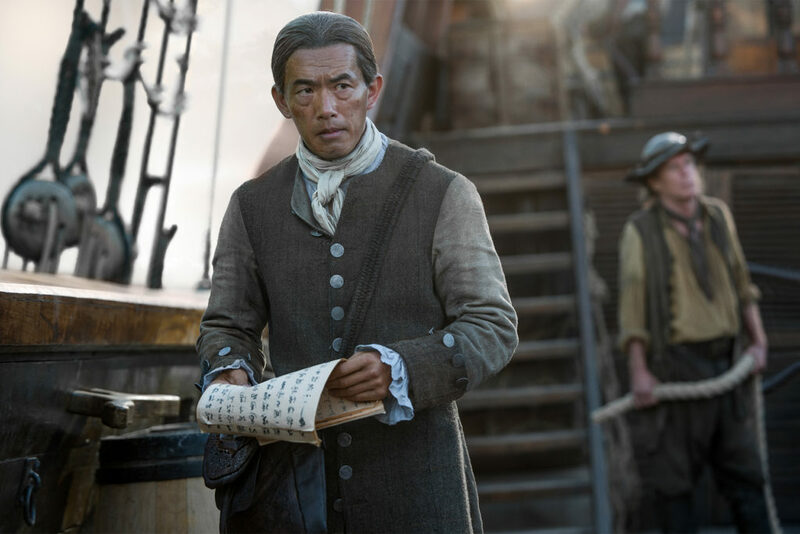 Now aboard the Porpoise, and able to help, Captain Leonard issues his crew to set sail thus trapping Claire and leaving Jamie behind. You’ll also notice this week’s opening theme has yet again been slighted adjusted. This is something I adore about Outlander, every story arc set in a new land gets accented in the opening theme. For Paris we heard the Skye Boat Song sung in French. And now the Skye Boat Song has been given some tribal beats to emphasize the indigenous people of the West Indies we’re about to meet (or so we assume). WE JUST GOT THEM BACK TOGETHER! Ugh! Those were literally my words shouted at the TV when Claire realizes what has happened on board the Porpoise. After what felt like an eternity of waiting for Jamie & Claire’s reunion, suddenly we find them separated again. The Porpoise has kidnapped Claire, or at least held her hostage until they can get to land so she can tend to their sick, and sent word back to the Artemis of their intentions. You know Jamie is not going to handle this news well. Claire is earnestly torn between her oath as a doctor, and her desire to be reunited with Jamie. So now we wait for them to be reunited again… Sigh. Now they say a woman on a ship is bad luck, but maybe having two women operates like a double negative and cancels each other out?! The crew of the Artemis isn’t so easily swayed by mathematical equations. They are looking for the Jonah who has brought all the bad luck on board. Captain Raines explains that out on the sea the crew needs something to believe in. It’s what gets the crew through their voyages at sea. On the Artemis, one of the crew’s superstitious beliefs involves everyone touching a horseshoe when embarking on a new journey (or else bad luck!). This is their superstition that cannot be countered as it has to happen at the beginning of the journey. Other superstitions have a turnaround, like a bare-breasted woman is calming to the sea thus making a bare-breasted woman aboard any ship good luck. While looking for their Jonah to throw overboard, Mr Willoughby notices a bird flying low symbolizing thick air and a possible rainstorm. Rain would bring clean water which the Artemis desperately needs. To stop the crew from harming their own, Mr Willoughby rings the deck bell, steps on a theoretical soap box and tells his story. It’s the perfect distraction. His story involves his own bit of misfortune in that while avoiding losing his manhood in the service of the Chinese Empire, he escaped to a foreign land where his love of all women could continue. However, being of a different background in a foreign land has basically branded him untouchable by all woman. Or as his put it, “even the lowest of whores will not lay with me.” To rid himself of this bad luck, he tosses his poetry into the ocean. The same poetry that brought him recognition in his homeland. This gestured symbol is perfectly timed so that the wind picks up and carries his pages off, and the crew can believe their bad luck is over because the winds have returned. But let’s talk about this one man’s suffering. What a backstory. What a delivery. What emotion. The humanity it gives to Mr Willoughby, and the sympathy in everyone’s eyes as they listen to his cry for help. Beautiful written. Expertly acted. I just wanted to run up and give the man a hug myself. Kudos to Diana Gabaldon, Ronald Moore and the whole creative team for this wonderful execution and subtle highlight of modern day stigmas and segregation.